FOR 20 - M M GUN Vp-2750 FT./SEC-Wp • 0.290 LB. Wc- 0.070 LB. BORE TRAVEL» 4.3 FT. Figure 2-5. Graph of Projectile Velocity Versus Time (20 mm Gun). and bore travel are available (figs. 2-4, 2-5, and 2 6; . As has been explained, the primary factor affecting the performance of a long-recoil operated gun is the weight of the recoiling parts and in order to obtain a reasonable rate of fire, this weight must be kept to the bare minimum consistent with the requirements for strength, rigidity, and durability. The weight of these parts will be affcctcd not only by strength considerations but also by the particular configuration of the mechanism selected by the designer. 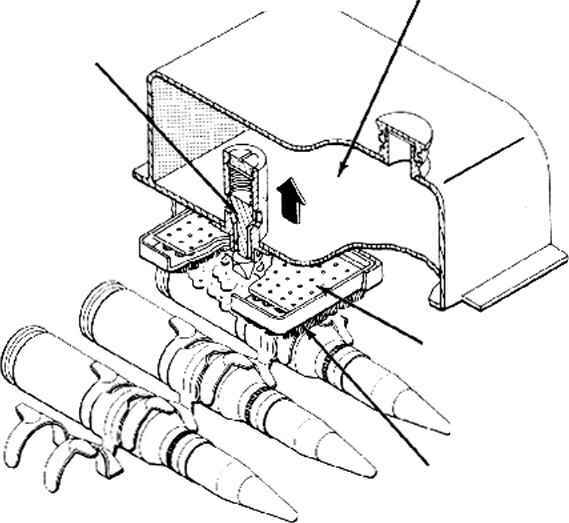 (For example, if the designer wishes to have the bolt slide in a long barrel extension, the recoiling parts might be heavier than they would be if the bolt moved on guide rails which were pari of the receiver.) Accordingly, in order to determine the weight of the recoiling parts, the barrel must be designed first and the remainder of the mechanism must be planned at least to the extent which will make it possible to obtain a fair preliminary estimate of what weights will be involved. In the process of planning the mechanism it will also be necessary to determine what distances the parts must travel. Of course, the final dimensions and weights of some of the recoiling parts can not be defined until complete consideration is given to the forces which act on these parts as the result of the accelerations and shocks to which they are subjected in operation and whirh yet remain to be determined. However, the estimated weight obtained from a carefully made preliminary design and layout should be accurate enough to serve as the starting point for the calculations necessary to determine the operating forces. It is these calculations which are the main concern of the following analysis. 2. Determination of the data necessary for designing barrel spring and bolt driving spring which will permit the recoil distance required for feeding. 4. Development of graphs showing how the velocity and travel of the recoiling parts vary with time.